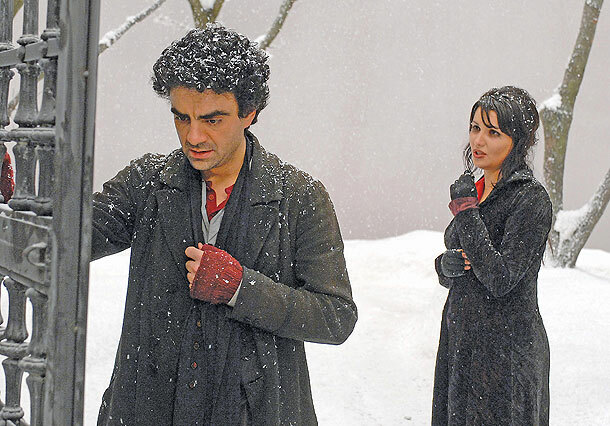 La Boheme is one of my favourite operas and with Netrebko and Villazon in the leads there was no way this film could fail. Opera and film don’t necessarily make the best bedfellows, I usually find filmed staged performances the best as you do get a sense of the theatrical experience and the music’s great. Going on location, as the Losey directed Don Giovanni (It-Fr-Ger, 1979) did, doesn’t work for me as the realist locations class with the artifice of opera. This Robert Dornhelm directed Boheme, however, works both as opera and film because it’s not constrained by shooting a staged performance and so can use the full gamut of film language such as the cut to a high angle medium close up for the moment Mimi declares her love. It helps that Netrebko is a beautiful woman… seriously: she is a fantastic singer. Dornheim also uses split screen and digital colouring to great effect making the version a marvelous cinematic experience. The set is suitably stylised, and looks great, perfectly fitting for the inevitable artifice of opera. This is a marvelous operatic and filmic experience so it is clearly the best opera on film I have ever seen.